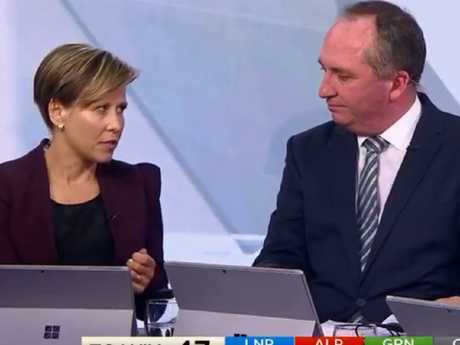 BARNABY Joyce has been called out for his "rude" treatment of a Labor Senator during a live on-air broadcast as part of Channel 7's NSW state election coverage. The senator and former Nationals leader joined Seven's coverage seated on a panel alongside Labor's Jenny McAllister in a segment that quickly became heated. 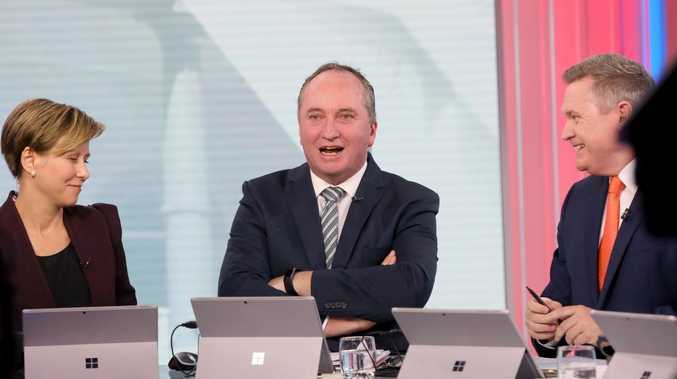 Making his first on-air remarks, Senator Joyce was asked his interpretation of early results in the cliffhanger election, which led him to rattle of a number of issues for Nationals voters. Asked by Seven's political editor Mark Riley if there was crossover with federal issues like "water, fish, drought", Senator Joyce was dismissive. "A lot of that, Mark, is a message for the city, it's not the message you hear in the country," he said. 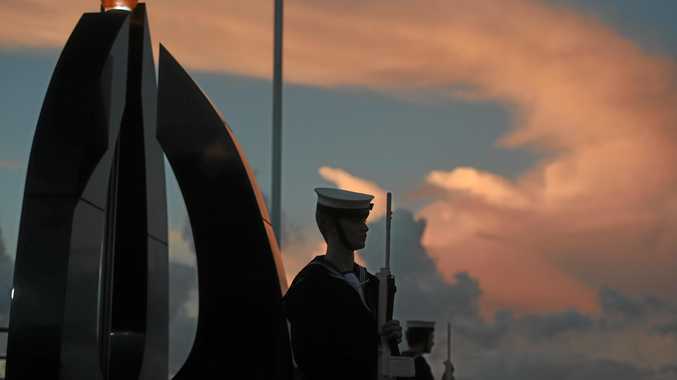 "What resonates for you is not what the true knowledge on the ground is in regional areas." Asked to weigh in, Senator McAllister said she was surprised at his remarks, but barely got through a sentence. "I am surprised that you'd not put water on the list of concerns," she said. "You've got these western NSW seats with massive fish kill and a very active conversation..."
This was the point where Senator Joyce began to interrupt and talk over Senator McAllister. "That was because of the Greens... you can't take water to the south, not have it come to the north, and not expect something to die in the middle. It's the bleeding obvious," he said as his fellow panellist tried to get her point across. Senator McAllister continued, saying "I think the proposition that's been put is that there's been complete mismanagement of the water system", before being again interrupted. "May I finish my remarks?" Senator McAllister said - a comment met by a shrug from Senator Joyce. She did continue, barely finishing her sentence before Senator Joyce had his say. "Finished? You're wrong," he said. Shocked viewers were quick to blast the Nationals Senator on Twitter, declaring his part in the exchange "so rude". 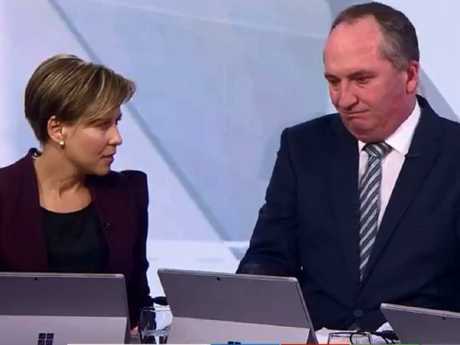 "Crushing Jenny McAllister's opinion in such an offhand manner will win you no friends Barnaby Joyce," one viewer wrote. "Please remove Barnaby Joyce from the panel. So rude, condescending, speaking over the top of everyone and just seems angry," another tweeted. News Corp columnist Annette Sharp said Senator McAllister had been "doing her best to not be silenced" by Senator Joyce, while colleague Holly Byrnes said the former leader had "reinforced why he is political poison" and also took aim at the panel's host. "Absolutely disgusting way to speak to the Labor panellist and should have been called out for it by Michael Usher and Seven," Byrnes tweeted. Even one of Senator Joyce's parliamentary colleagues called out his performance on the panel. Appearing on ABC's election coverage, Liberal MP Trent Zimmermann suggested his colleague "spend more time in Tamworth and less time on TV".